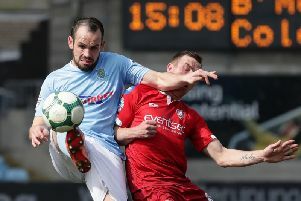 Ballymena United new boy Gareth Rodger has backed his parent club manager’s view that a spell in the Irish League will further his career. The Sottish defender has joined on loan from St Johnstone - managed, of course by former Showgrounds supremo Tommy Wright - initially until January. Gareth Rodger had an assured debut for Ballymena United in Saturday's defeat at Dungannon Swifts. Picture: Press Eye. “Tommy told me Ballymena is a really good club,” Gareth told Times Sport. “He said it has always been a good club for young players coming through and to go and get experience. “Tommy obviously knows Glenn very well which is a help as well and everything he said about Ballymena has proved to be true. Rodger produced an assured display in the centre of defence, even though his first appearance ended in a 2-0 defeat at Dungannon Swifts. “Apart the result, which was disappointing, I enjoyed it. “It was a good challenge. I thought the boys did really well and that we deserved something more out of the game. “But that happens sometimes when you’re pushing and pushing you concede goals on the counter-attack. “It wasn’t our day but I think we can push on and overall I enjoyed the game. Rodger has already had loan spells at Montrose and Brechin City and believes the standard of the Irish League compares favourably with the lower leagues in his homeland. “It’s certainly a good standard. I thought Dungannon played some good football and we did as well, which made for quite an exciting game. “Despite being thrust into the cauldron of United’s dreadful start to the season, Rodger remains unfazed by the task facing the Sky Blues. “It hasn’t been hard coming in at all - I feel that I’ve fitted in and that I’ve been here for longer than I actually have. “I was at training on Thursday night and everybody was in high spirits. While his longer-term target is to break into the first team at St Johnstone and establish himself in the Scottish Premier League, Gareth admits his short-term focus is very much on Ballymena. “The main thing for me is getting a lot of first team competitive games under my belt and to take that back to St Johnstone. “While I’m here I’m fully committed to Ballymena and I want to help us end the losing streak we’re on and then climb the table,” he added.